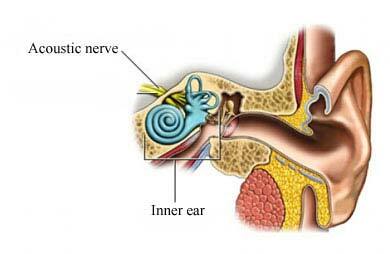 An acoustic neuroma is a tumor that grows on the nerve of the ear. This nerve runs from your brainstem to the ear and plays a role in hearing and in maintaining your balance. This is a benign tumor, which means it is not cancerous. However, this condition can still cause serious problems if the tumor is large enough to put pressure on your brainstem. A tumor is caused by the abnormal growth of cells. This growth is determined by genes of the cells. An acoustic neuroma is caused by a problem with specific genes. It is not clear what causes the problem with the genes. Some environmental factors may play a role. If headaches or mental confusion occur, the tumor may be life threatening. Call your doctor right away. Tumors may stay very small and cause few problems. In this case, the tumor may not need treatment. The doctor will monitor it for any changes. This is approach is common among people over age 70. If the tumor is causing problems or is growing large it may need to be removed. The type of surgery depends on the size and location of the tumor. Complications of surgery may include permanent hearing loss and/or paralysis of facial muscles on the affected side. Radiation therapy is the use of radiation to kill cells and shrink tumors. It may also stop further growth of the tumor. Radiation may be used when tumors are small and surgery is not possible. This method may preserve hearing. The radiation may be given over several treatments or as one large dose. A procedure called stereotactic radiosurgery may be used. This surgery uses a focused beam of radiation to destroy tumor tissue in and around the brain. There are no current guidelines to prevent acoustic neuroma. Acoustic neuroma. American Hearing Research Foundation. Available at: http://american-hearing.org/disorders/acoustic-neuroma. Updated October 2012. Accessed September 5, 2017. Acoustic neuroma. VEDA website. Available at: http://vestibular.org/acoustic-neuroma. Accessed September 5, 2017. What is acoustic neuroma? Acoustic Neuroma Association website. Available at: https://www.anausa.org/learn-about-acoustic-neuroma/what-is-acoustic-neuroma. Accessed September 5, 2017.